Extraordinary small size combined with easy handling are the outstanding characteristics of the base model of the new Leica DISTO™ family now available from Merlin Lazer Ltd. Direct function buttons for additions and subtractions, for area and volume calculations make measurements extremely easy. Minimum and maximum are new measuring functions. These functions are especially indispensable for horizontal measurements without tripods or to stake out distances. This "smallest“ of distance meters is a pleasure to measure with. The inventor of hand laser measuring instruments is now introducing the Leica DISTO™ A3, a very handy and easy to use instrument, to the market. Due to the new Power Range Technology™, measurements up to 80m without any target plate are now possible. Precise and within seconds, the Leica DISTO™ A3 measures with an accuracy of ± 1.5 mm. 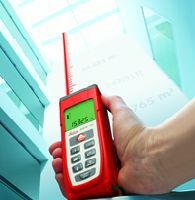 With the integrated level and the compact size, the instrument can also be used as a spirit level. It makes levelling objects e.g. plug sockets, very easy - an additional feature that electricians will enjoy. Measured results no longer have to be written down at once. The last 20 measured results are stored to the memory along with the relevant information (e.g. area, reference). At the same time with the small base model, Leica Geosystems is introducing the Leica DISTO™ A5. With multiple supplementary functions, integrated telescopic viewer (2-fold magnification) and an unique multi-functional end piece, it is the first choice for all applications. Together with the top-model, the Leica DISTO™ plus we can now provide you with the right instrument for every area of application. Whether you "only“ want to make a simple distance measurement or whether you want a wireless transfer of measured data to a PC for further processing - the Leica DISTO™-family provides the perfect solution. Due to the high quality and reliability, Leica Geosystems grants a two year warranty on Leica DISTOs™. With these innovative hand laser-measuring instruments, Leica Geosystems in conjunction with Merlin Lazer Ltd will consolidate and further expand its position as market leaders.